The Redlichiina are a group of relatively plesiomorphic trilobites known from the Lower and Middle Cambrian (Harrington et al. 1959). Some members of this group grew very large; the Middle Cambrian North American species Paradoxides davidis was almost two feet long (Prothero 1998). Characters (from Harrington et al. 1959): Dorsal exoskeleton elongate, subelliptical in outline. Cephalon semicircular to semielliptical, mostly with prominent genal spines; glabella with subparallel sides, narrowing fonvard, or expanding fonvard, generally well segmented; facial sutures opisthoparian; eyes mostly large, tending to be crescentic. Thorax with numerous segments. Pygidium small. [A38] Alcock, F. J. 1938. Geology of Saint John region, New Brunswick. Geological Survey of Canada Memoir 216: 1–65. [F05] Fletcher, T. P. 2005. Holaspid variation in the solenopleurid trilobite Parasolenopleura gregaria (Billings, 1865) from the Cambrian of Newfoundland. Palaeontology 48 (5): 1075–1089. [FO99] Fortey, R. A., & R. M. Owens. 1999. Feeding habits in trilobites. Palaeontology 42 (3): 429–465. Harrington, H. J., G. Henningsmoen, B. F. Howell, V. Jaanusson, C. Lochman-Balk, R. C. Moore, C. Poulsen, F. Rasetti, E. Richter, R. Richter, H. Schmidt, K. Sdzuy, W. Struve, C. J. Stubblefield, R. Tripp, J. M. Weller & H. B. Whittington. 1959. 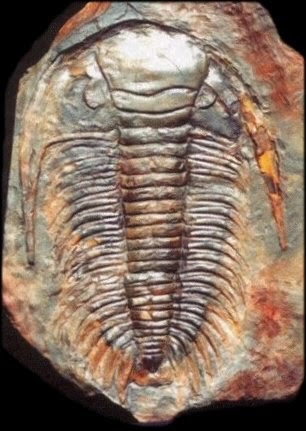 Trilobita. In: R. C. Moore (ed.) Treatise on Invertebrate Paleontology pt O. Arthropoda 1, pp. O38-O540. Geological Society of America and University of Kansas Press. [P79] Palmer, A. R. 1979. Cambrian. In: Robison, R. A., & C. Teichert (eds) Treatise on Invertebrate Paleontology pt A. Introduction. Fossilisation (Taphonomy), Biogeography and Biostratigraphy pp. A119–A135. The Geological Society of America, Inc.: Boulder (Colorado), and The University of Kansas: Lawrence (Kansas). [SS84] Shergold, J. H., & K. Sdzuy. 1984. Cambrian and early Tremadocian trilobites from Sultan Dağ, central Turkey. Senckenbergiana Lethaea 65 (1–3): 51–135. [T10] Taylor, T. G. 1910. The Archaeocyathinae from the Cambrian of South Australia with an account of the morphology and affinities of the whole class. Memoirs of the Royal Society of South Australia 2 (2): 55–188. [ZS01] Zhang, X., D. Shu, Y. Li & J. Han. 2001. New sites of Chenjiang fossils: crucial windows on the Cambrian explosion. Journal of the Geological Society 158: 211–218.